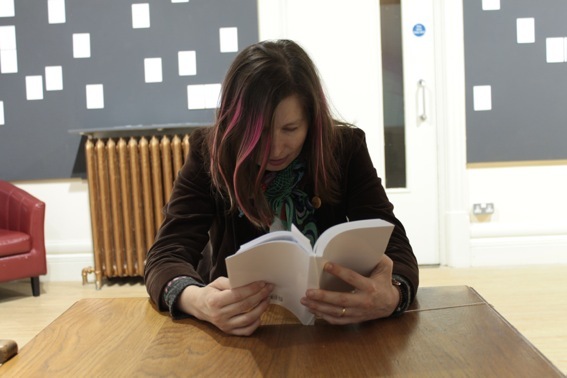 Cartography for Girls was the title of an exhibition at Crown Street Gallery in November 2015. The title refers to my attempts as an artist to map something of the experiences of women in the 26 novels of Iris Murdoch, which were originally published between 1954 and 1995. I use the text from the novels as my material, and the exhibition showed three different mappings of this text. The first one was a video made via Skype with volunteer participants, of women reading descriptions about women from the novels. The idea behind the film was for the viewer to consider whether these descriptions were reliable or unreliable, as many of them were presented to the reader through Iris Murdoch writing as an often-unreliable male narrator. Possibly Iris Murdoch is better known for her novels by first person male narrators, including the prize winning The Sea, the Sea and The Black Prince. The second mapping was a book, Cartography for Girls, An A-Z of Orientations identified within the Novels of Iris Murdoch. The book was made up of all of the thoughts of all of the women in all of the novels. I called them ‘orientations’, because in Iris Murdoch’s moral philosophy, she describes seeking the truth as ‘an orientation, a direction of energy, not just a state of mind’. I wanted to see what the women characters thought about – how they oriented themselves in relation to truth, and to reframe this in another context. The alphabetization causes the book to read like a poem and gives an alternative picture of these women’s treatment by their author. I’m interested in Murdoch’s ideas about the dangers of classification, for example, is a thought morally evaluative or evaluating? And also in the re-classification of Iris Murdoch who isn’t regarded as a feminist writer, but more recently this is being re-examined, with a new interest in gender in both her fiction and her philosophical work, and after her highly publicized death from Alzheimer’s Disease in 1999. 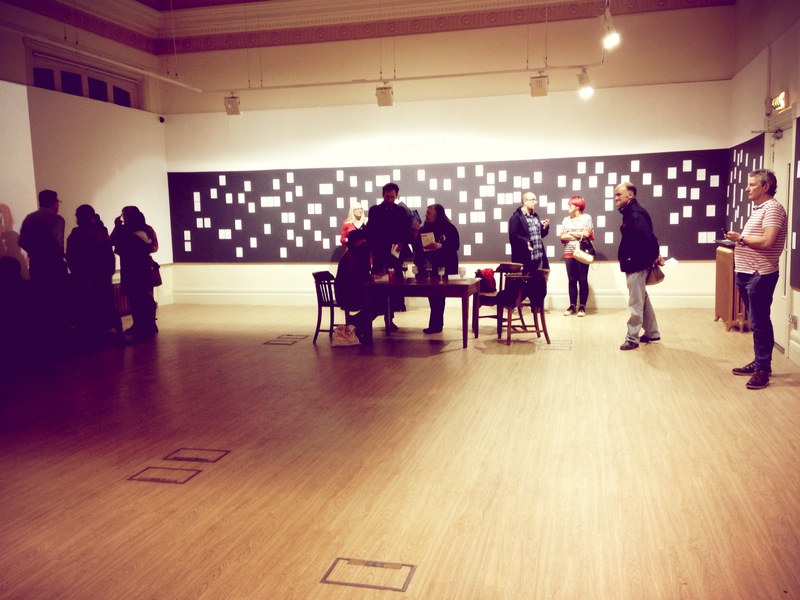 The third mapping was a series of postcards on two of the gallery walls. Each postcard featured a single quote from the collated, alphabetized quotes in the A – Z. The quote’s position on the card mirrored its place in the novel where it originally comes from. People seemed to identify with a lot of these quotes at the exhibition, which I think shows the power of Murdoch’s writing to resonate today. 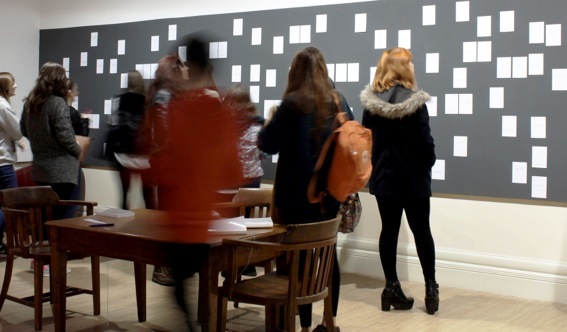 The show gave me a fantastic opportunity to see if this work struck a chord with visitors or not, and it set up some great discussion that certainly informed the way I developed the work after the exhibition.